The one-time Catholic patron saint of travelers, Saint Christopher -- whose name means "Christ carrier" -- is not mentioned in the Bible. While there may have been a 3rd century Greek martyr named Christopher, the story told of him is now generally acknowledged to be a 12th century addendum to the Christian canon. 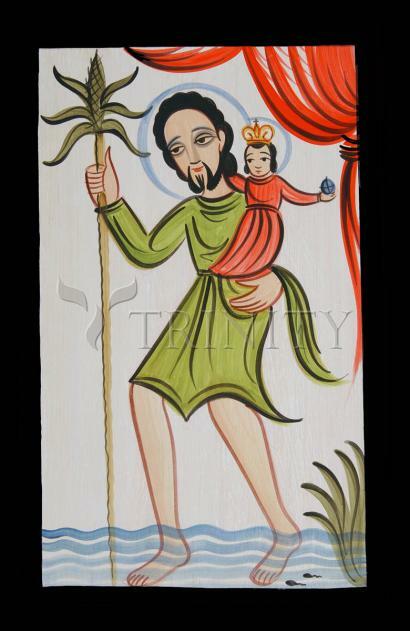 Christopher is typically depicted as a tall, middle-aged, bearded man with a staff who wades across a river carrying the Christ child on his shoulders. As the story goes, the extremely robust Christopher devoted his life to carrying people across an otherwise unfordable stream. One day a little child appeared before him and asked to be carried across. To Christopher's surprise, as he forded the river, the child steadily increased in weight until Christopher found his tiny burden so heavy that it was almost impossible to bear. When he asked the holy babe why he weighed so much, the child replied that he carried the world's sins upon his shoulders. As a reward for his service, Christopher's staff was miraculously transformed into a living tree, and Christopher himself became the Patron Saint of travelers. A martyr, probably of the third century. Although St. Christopher is one of the most popular saints in the East and in the West, almost nothing certain is known about his life or death. The legend says: A heathen king (in Canaan or Arabia), through the prayers of his wife to the Blessed Virgin, had a son, whom he called Offerus (Offro, Adokimus, or Reprebus) and dedicated to the gods Machmet and Apollo. Acquiring in time extraordinary size and strength, Offerus resolved to serve only the strongest and the bravest. He bound himself successively to a mighty king and to Satan, but he found both lacking in courage, the former dreading even the name of the devil, and the latter frightened by the sight of a cross at the roadside. For a time his search for a new master was in vain, but at last he found a hermit (Babylas?) who told him to offer his allegiance to Christ, instructed him in the Faith, and baptized him.